Gilbert Conwall Wiltse was appointed to the Naval Academy from New York, and graduated on September 20, 1855. He became a midshipman on June 9, 1859, and was ordered to the frigate, Congress, the flagship of Admiral JS Sands, cruising on the Brazilian Station from 1859 to 1861. He was made Lieutenant on Aug. 31, 1861. The Congress was recalled from the station upon the breaking out of the civil war, and Wiltse was detached from that vessel and ordered to the St. Lawrence of the home squadron, in which ship he was present at the engagement of the Confederate ram, Merimac, with the Congress and the Cumberland, in Hampton Roads, on March 8 and 9, 1862. He was also in the engagement with the Sewel Point batteries in May, 1862. He served on the steam sloop, Dacotah, of the West India squadron in 1862-63, and in the Atlantic blockading squadron in 1863-64. He had a taste of hot work in the engagement of monitors with Forts Sumter and Moultrie in Nov. 1863. He was commissioned Lieutenant Commander on March 3rd, 1865. He served with distinction all through the civil war. He served successfully on the steamer Agawam, Atlantic squadron, 1866-67; apprentice ship. Saline, 1867-68; navy yard, New York, 1868-69; on monitor, Saugus, North Atlantic fleet, 1869-70; navy yard, Pensacola, 1870-72. On November, 8, 1873, he was made commander and put in charge of the Sawmut, North Atlantic squadron, 1875-76. He was on shore duty at the New York Navy yard, 1878-81, and assigned to the command of the Swatara, North Atlantic squadron, 1884-85. When in command of the Swartara, he was the conveyor of several millions of dollars in silver coin from New Orleans to New York, and it was when in command of that vessel in the harbor of Aspinwall that he protected the three political refugees. He was promoted to Captain on Jan. 20, 1887, and placed in command of the receiving ship, Franklin; and then the U. S. steamship, Minnesota. He was assigned to the command of the Boston in 1891. The Boston was under his command with the Baltimore and the Yorktown, in the harbor of’ Valparaiso, when the men of the Baltimore were attacked in the streets of that city. His last service with the Boston. Captain Wiltse of the US Navy was in command of the USS Boston when the Hawaiian revolution occurred; and, at the request of United States Minister Stevens, landed a detachment of marines. Following the Civil War, the US Navy rapidly demobilized, and for the next 15 years the fleet was shrinking and becoming technologically obsolete. A law of 1883 had signaled the end of the old Navy. Repairs were prohibited on wooden warships whenever the cost would exceed 20% of the cost of a new ship of the same size and type. New construction favored steam while still carrying sails. In addition, American ships were to be built of American-made steel. Then, naval shipbuilders were introducing a new policy, new ships. Bids for the new vessels were opened on July 2, 1883. Eight firms participated in the competition. The proposal of John Roach, whose shipyard was at Chester, Penn., was the lowest, and it was accepted. The first four vessels of the “New Navy” came to be known as the ABCD Ships because their names began with the first four letters of the alphabet – Atlanta, Boston, Chicago and Dolphin. They were also known as the “White Squadron” (named for the group’s white-painted hulls.) 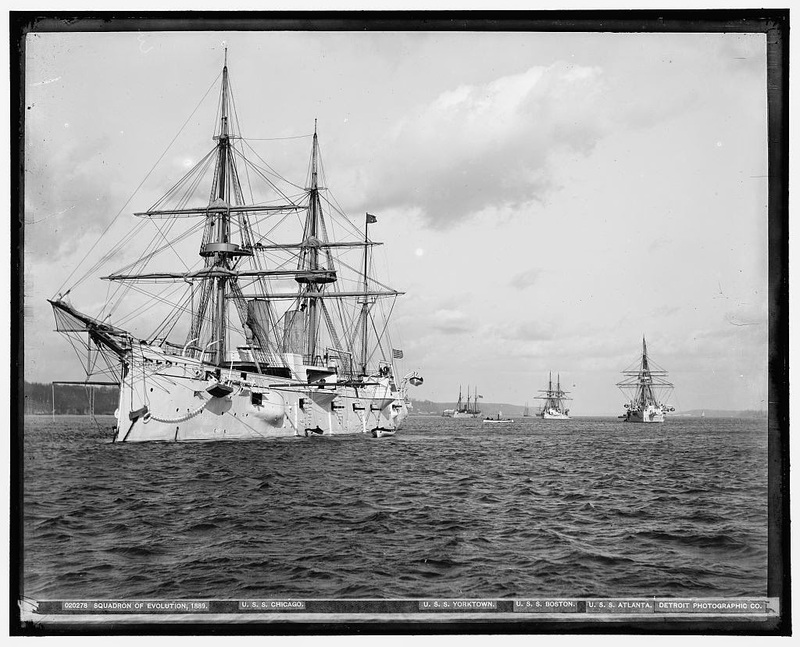 Later, other ships were added to the growing, modernizing Navy. Three years later the Squadron was strengthened by the addition of the cruiser Baltimore and the gunboat Vixen and was ordered to prepare for action by Undersecretary of the Navy Theodore Roosevelt. There are some Hawaiʻi ties to a couple of the ABCDs – the Atlanta and the Boston. Named for a city in northwestern Georgia (originally called Terminus and later Marthasville,) the community was renamed Atlanta when it was incorporated as a city in 1847. The ship was the second to carry the City’s name (the first was a gunboat acquired by the Navy in the autumn of 1858 and later renamed Sumpter.) The new Atlanta was part of the new Navy. When Queen Kapiʻolani traveled to celebrate the Queen Victoria’s Golden Jubilee in England in 1887, while on a stop in New York, Commodore Bancroft Gherardi invited the Queen to visit the Brooklyn Navy Yard – he wanted to show off some of the new Navy ships. In a follow-up thank you note (May 30, 1887) from Henry Alpheus Peirce Carter (who coordinated the Queen’s state visits) to US Secretary of State Thomas Francis Bayard notes, “Her Majesty Queen Kapiʻolani (requests) you to convey to the honorable Secretaries for War and of the Navy, her grateful thanks for the attentions and honor paid her … by Commodore Gherardi and officers of the United States Navy at the navy-yard at Brooklyn, on the occasion of her visit”. A later sight of the Boston was not as pleasant. In accordance with that order, the battalion of the Boston landed at Brewers Wharf, in the city of Honolulu, at 5 pm, January 16, 1893. After the battalion was formed, they marched first to the United States consulate, where Lieut. Draper, with his company, was detached with orders to proceed to the legation and leave half his command in charge of the orderly sergeant, returning with the remainder to the United States consulate, himself, and remain there as a guard until further orders. The remainder of the battalion then marched down King Street. In passing the palace the battalion, in column of companies, gave a marching salute, trumpeters sounding four ruffles in honor of the royal standard, which was flying there. At 2:30 pm the next day, a civilian, armed, reported that a policeman had been shot while attempting to stop a wagonload of ammunition which was being conveyed to the old armory where the civilian forces enrolled by the committee of safety were then assembling, and that a large crowd was collecting on Merchant Street. The battalion was immediately assembled under arms in the yard in rear of the building to await developments. Until nearly 6 o’clock, the men leading the citizens’ movement had assumed charge of the Government building without opposition of any kind; the civilian companies under arms had marched in and established a line of sentries about the Government building. The Boston’s battalion was kept in rear of the camp, at their company parades, with arms stacked. About 1 pm, they were notified that a Provisional Government, of which Mr. SB Dole was presiding officer, was in complete possession. A letter from the United States minister recognized it as the de facto government of the Hawaiian Islands, and the battalion was to consider it as such. On January 19 new quarters were provided for the battalion at the unoccupied house on King street, the property of Mr. CR Bishop. That home was formerly the home of Abner Pākī and his wife Laura Kōnia (Kamehameha III’s niece.) Their child, Bernice Pauahi Pākī and hānai daughter, Liliʻu (later Queen Liliʻuokalani) were raised as sisters. The battalion of the Boston named this former home of the Queen Camp Boston. A proclamation from Minister Stevens establishing a protectorate over the Hawaiian Islands in the name of the United States, pending negotiations with the Hawaiian Commissioners at Washington, was read. The image shows the ABCD ships, the Squadron of Evolution. In addition, I have added others similar images in a folder of like name in the Photos section on my Facebook and Google+ pages. In accordance with that order, the battalion of the Boston landed at Brewers Wharf, in the city of Honolulu, at 5 pm January 16. The following summarizes the forces that landed: Company A, Artillery, 40 men; Company B, Infantry, 35 men; Company C, Infantry, 34 men; Company D, Marines, 30 men; Color guard, 4 men; hospital corps, 1 apothecary, 4 stretchermen; signalmen, 2; music, 3. Total, 153 men, 11 officers. Each man carried the regulation knapsack, with blanket and change of clothing, haversack with mess gear and ration of hard bread, and filled canteen. Those armed with Lee rifle wore the double webbing belt carrying 60 cartridges in the loops and 20 in magazines. The marines were fitted out with the same belts, but the loops only were filled. The ammunition boxes of the Gatling gun contained four filled Accle’s Feeds and 1,380 extra rounds of .45 caliber in pasteboard boxes. The ammunition boxes of the 37 mm contained 64 cartridges, common shell. Reserve ammunition in 37 mm. caisson was as follows: After compartments, 112 37 mm. cartridges, common shell; forward compartment 1,600 caliber .45 cartridges in pasteboard boxes; top or center compartment, four filled Accle’s Feeds, and 800 .38 caliber revolver cartridges. On arriving at the residence of Mr. JB Atherton, an American, the command was halted, and permission having been obtained, was marched into the grounds, arms stacked and ranks broken. About 8 in the evening the battalion marched to Arion Hall and camped there. During the night the men were kept ready for an instant’s call, but there were no disturbances of any kind. At reveille the next morning, 17th, the camp routine was published and has been strictly carried out in all its details. Latrines were built in the yard and every sanitary precaution taken. At 2:30 pm, a civilian, armed, reported that a policeman had been shot while attempting to stop a wagonload of ammunition which was being conveyed to the old armory where the civilian forces enrolled by the committee of safety were then assembling, and that a large crowd was collecting on Merchant Street. During the night, again, officers and men were kept ready for a moment’s call, but the city was perfectly quiet. During the day of the 18th the royal standard was hauled down over the palace, and the household troops disbanded, by order of the Provisional Government, except a small guard of honor, who accompanied the ex-Queen to her residence on Beretania street. On January 19 new quarters were provided for the battalion at the unoccupied house on King street, the property of Mr. CR Bishop. Having thoroughly policed the old camp, the battalion moved into the new quarters at 1:30 pm. Daily routine followed. In accordance with verbal orders given the evening of January 31, the battalion was paraded on the morning of February 1, at 8:30, in front of the quarters – ‘A’ Company as artillery with Gatling and 37 men; the rest as infantry in light marching order. As the line was formed, a written order, dated February 1, was given; in obedience to those orders the battalion marched to the Government building, where we were received by the civilian troops, who presented arms as they entered. President Dole and all members of the ministry and advisory council were also present. According to the order, Col. Sofer, Commander in Chief of the Provisional Government forces, at once turned over the custody of the building to Lieut. Commander Swinburne. At 9 am, the United States ensign was hoisted over the building, the battalion and civilian forces presenting arms. The Hawaiian flag, hoisted on the pole in the grounds, received the same salute. The civilian forces of the Provisional Government were then withdrawn and the custody of the building turned over to Lieut. Draper with his company of 25 marines, which were withdrawn from the United States consulate for the purpose, the guard at the United States legation being continued but reduced to 5 men. The blue jacket companies of the battalion then returned to their quarters. 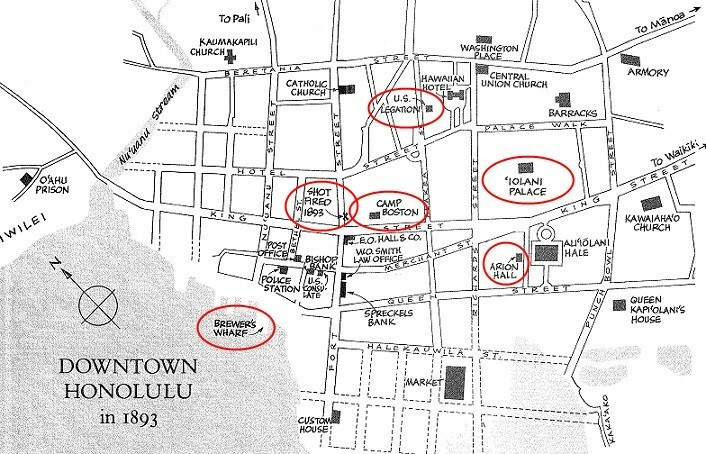 The image shows an 1893 map of Honolulu with some of the contact points noted in this summary. In addition, I have included other related images in a folder of like name in the Photos section on my Facebook and Google+ pages.